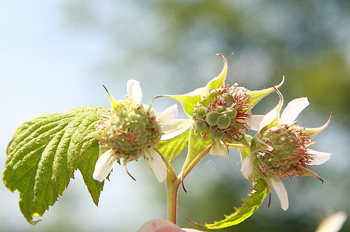 Wild red raspberry is a native shrubby plant; a durable root produces the prickly, biennial stem with alternate, pinnate leaves consisting of 3-5 narrow, oblong-ovate, acuminate leaflets. The white, cup-shaped flowers appear in spring and summer of the second year. The red edible fruit, made up of cohering drupelets, ripens during the summer. 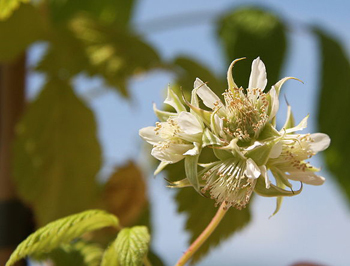 Garden raspberry is a shrubby plant; growing as high as 6 1/2 feet, the biennial stems have few or no prickles and bear alternate, pinnate leaves with 3-7 serrate, broad-ovate to oblong-ovate cordate leaflets which are usually downy white underneath. Clusters of 1-6 white flowers appear in the upper axils during spring and summer of the second year, producing the familiar red fruit which ripens later during the summer. Widespread in thickets and untended fields over North America. Widely cultivated for its fruit but which also grows wild in and around forests in Europe. In days of old, when midwives were the primary health care providers to women, “natural” childbirth was the only way to have a baby. Then, the leaf of the raspberry bush (Rubus idaeus) was the herb of choice. Routinely, women brewed the tea to drink it during the last 2 months of pregnancy. This was to tone the uterine muscles for labor and delivery. After the birth, the tea was continued for several weeks to help the uterus return to normal. The Chinese name for the red raspberry (Rubus idaeus) is Fu-p’en-tzu, which means “a turned-over bowl” in reference to the shape of the fruit. This common raspberry grows in many parts of the world; including the uplands of the central and western provinces of China. Good for diarrhea, dysentery, intestinal flu, vomiting, nausea, hemorrhoids, sores, wounds, and female disorders such as morning sickness, hot flashes, menorrhagia, and menstrual cramps. Strengthens the uterine wall, relaxes uterine and intestinal spasms, and decreases menstrual bleeding. Heals canker sores and promotes healthy nails, bones, teeth, and skin. It was once taken by pregnant women to prevent miscarriage, increase milk, and reduce labor pains. Fresh raspberries are mildly laxative. 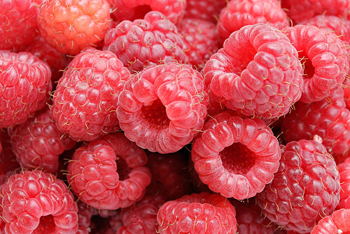 American raspberry has a good reputation for reducing miscarriage but other varieties are known to promote abortion. As with its wild cousin above, garden raspberry makes a leaf tea that is good for diarrhea, menstrual cramps, cystitis, and is a good beverage. Sometimes it is used as a gargle for sore throat, a mouthwash for sores in the mouth, or as an external wash for sores, wounds, skin rashes, etc. Fresh juice, mixed with a little honey, used to reduce fever. Made into a syrup or taken with wine vinegar, the juice is said to have a beneficial effect on the heart. Infusion: steep 1 oz. leaves or dried herb in 2 cups water for 15 minutes, covered. Take 1 to 2 cups a day. Add a little honey, if desired. Infusion: steep 1 to 2 tbsp. leaves in 1/2 cup water. Take 1 cup a day. Add a little honey, if desired. Extract: mix 15 to 30 drops in warm water for best results. Take 3 times per day. Tea: drink 1 cup of tea per day. Syrup: cook 7 parts fresh juice with 10 parts sugar until the desired consistency is obtained. Vinegar: mix 1 part raspberry syrup with 2 parts wine vinegar. May interfere with iron absorption when taken internally. Care should be taken in cases of chronic constipation. 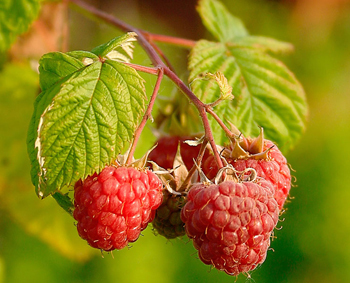 American raspberry has a good reputation for reducing miscarriage but other varieties are known to promote abortion. Do not take during pregnancy until the last 2 months, and then only under the supervision of a qualified health practitioner.